Late Saturday evening we turned onto our familiar street, pressed the garage door opener, and pulled our van -- a van crammed with bags, beach toys, mostly-finished water bottles, crinkled wrappers from snacks, and five tired passengers -- into our garage. Another vacation is in the books. The van has been emptied and vacuumed and all bags are unpacked, but somehow my thoughts still are roving and rambling, making it hard to buckle down into regular home life. Vacation, it seems, is a time for many things. It's a time to read everything you can get your hands on. It's when pages blow in the salty air and crinkle at the edges as you prop the book against your swimsuit and recline in a chair. 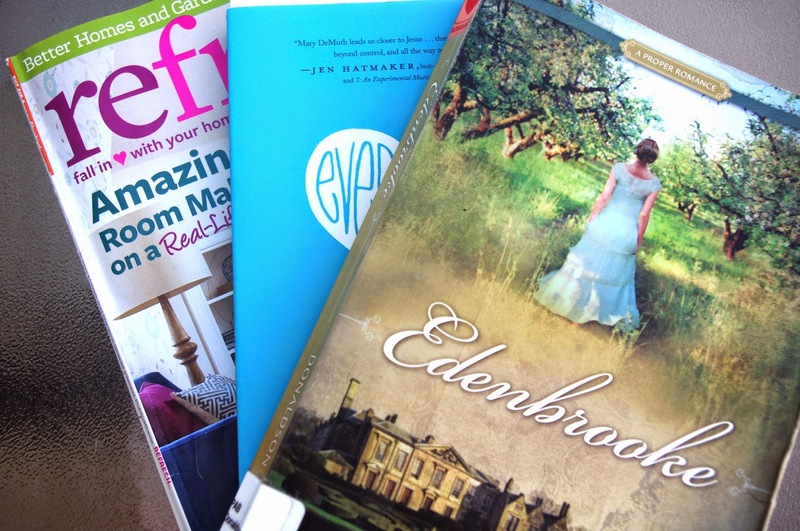 I became lost in the pages of Edenbrooke, a romance so gloriously delicious that I wanted to douse it with syrup. (The love letter alone! Heavens me!) I was encouraged from the pages of Mary Demuth's Everything, and creatively inspired by the DIY home magazines that my mother-in-law passed along to me, a colorful page-by-page reminder that I had an end table sitting in my garage waiting to be refinished when I returned home. Vacation is a time to eat. So much eating. (So, so, so much eating!) It's a time to eat food that you normally don't eat because it's bad for you, like donut holes, Swedish fish, Pop Tarts, and nightly ice cream. It's also a time to savor food that you normally don't eat because location doesn't allow, like fresh crab cakes. Vacation is a time to explore. To walk on a nature trail with kids, listening to nothing but bird calls and the low hum of dragonflies. To wait patiently at the water's edge until you spot the faint outline of a jellyfish. To get so caught up outdoors that you forget that inboxes, blog dashboards, and smart phones exist. Vacation is a time for crabbing, feet dangling over the edge of the pier, as you wait for the gentle yank that tells you something's nibbling the chicken on your line. It's a time to rejoice when a crab gets pulled from the water, a time for shouting, "Back up! Give 'em room!" as the crab scuttles out of the net, dances across the boards, and plunks back down into the water again. Vacation is a time to ponder how armies mobilize efficiently and strategically, considering that it's nearly impossible to get seven children (our three kids, plus four nieces and nephews) in flip flops, with sunscreen, and out the door. Vacation is a time to be silent and remember that starkness and broken pieces can be beautiful. It's a time to consider the might and power of a God who poured the water into the ocean. Vacation is a time to swim and get flip-flop shaped tan lines on your feet. It's a time to take a few nighttime jogs when you think you're running much faster than you actually are. It's a time to play a game of Yahtzee on the screened-in back porch after all the kids finally have gone to sleep. 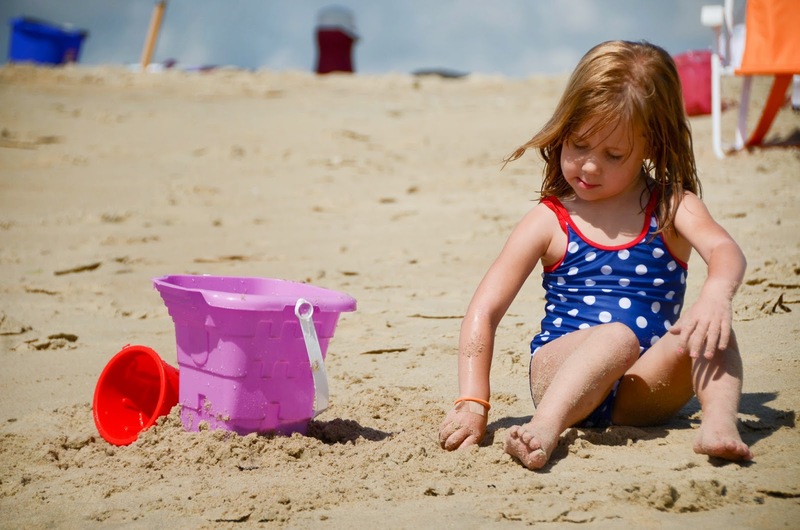 It's a time to dig in the sand. And a time to sit on the pier with your cousins. Vacation is a time to play a round of mini-golf without keeping score, and to say, "Sure, why not," when your daughter asks for popcorn on the boardwalk even though there's no way she could still be hungry after eating funnel cake and licking powdered sugar off her fingertips. And, inevitably, at the end of the week, it's a time to wave goodbye to those houses from the passenger seat of your over-packed van, and then to start the drive back home. Loved these glimpse of your holiday. Sounds and looks like a wonderful trip. I love that the girls were prompted to put their arms around each other. That picture is perfection. The girls were great sports, indeed. :) I love that picture, too! Sitting here in an Australian winter, with 2 weeks school holidays which I'm working through, I am craving family fun time and enjoying summer vicariously through northern hemisphere bloggers! Oh, I'm so glad that you can live vicariously and get a taste of summer! Edenbrooke IS so delicious you have to eat it with a spoon. And Swedish Fish. So glad your vacation was amazing. Come to think of it, I'm pretty sure I did read it while eating Swedish Fish, which is happiness on top of happiness.